What a fun surprise! A few weeks ago I won a giveaway on Craftberry Bush for these festive cloth pumpkins. Last week they arrived in beautiful shades of copper and ivory from Timewashed, an Etsy store that features lovely handmade and vintage goods. They are hand crafted by Becky and each one has a real dried pumpkin stem! Of course, I am thrilled to have these to add to our fall decor. 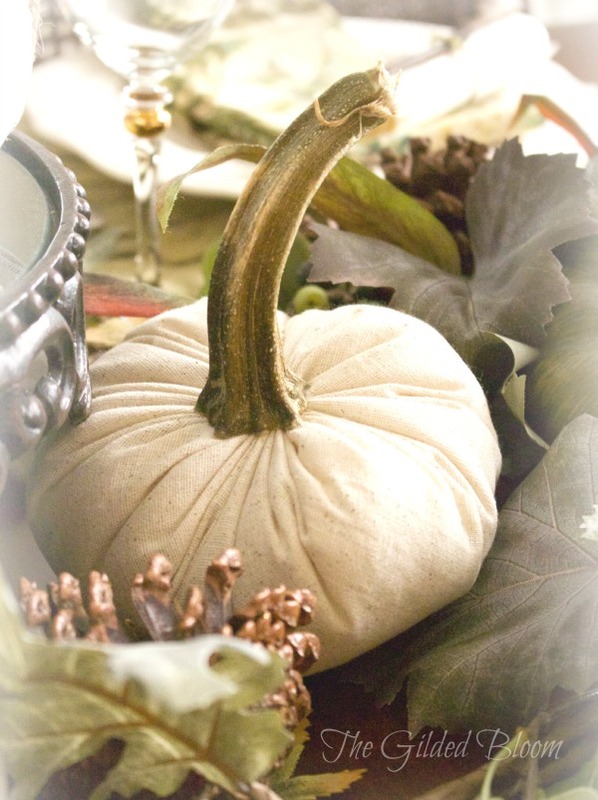 Since I am planning a special dinner celebration this week, I used them as a centerpiece on our dining room table. The pumpkins are different sizes and are made out of velvet, muslin and ticking striped fabrics. 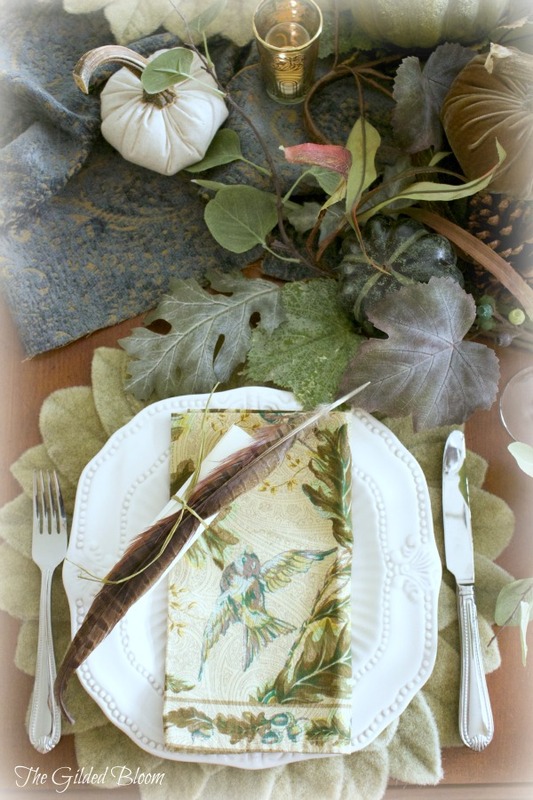 The fall theme of the table and the neutral color scheme are highlighted by the use of feathers and printed bird napkins. To set off the centerpiece, I chose a pumpkin garland in complementary colors and a teal damask upholstery fabric runner. Cake plates provided varied heights for the pumpkins. 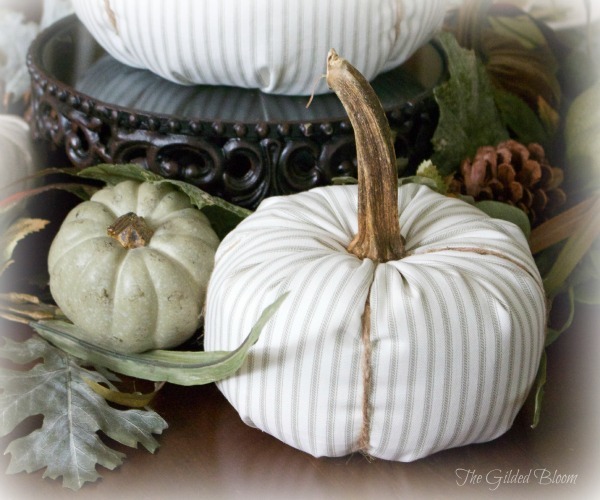 The muslin pumpkin has great texture and is nestled into the garland. 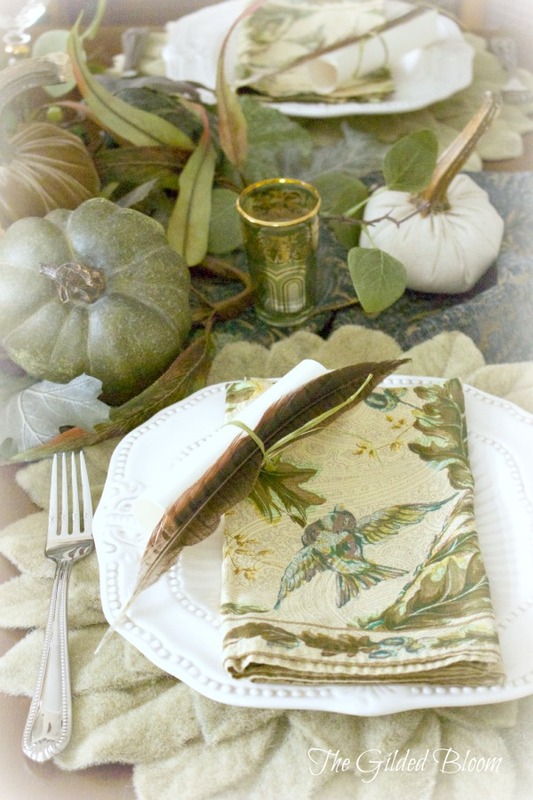 Each place setting has a menu tied with a feather and raffia ribbon. Congratulations on winning that fantastic giveaway. 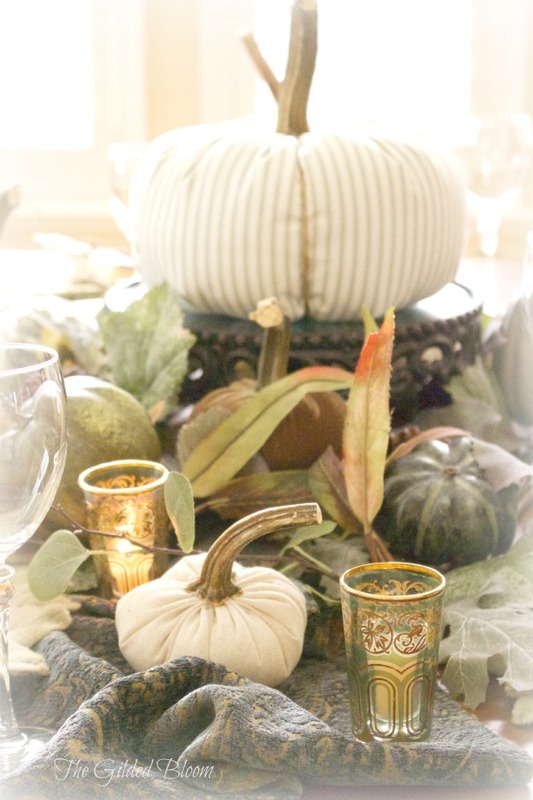 The table is beautiful, it really made those gorgeous pumpkins look elegant. Thank you Karen. It was such a happy surprise to win the contest. I'm glad you like the table. It was fun to style with the pumpkins. Oh Lisa! Everything looks soooo beautiful! 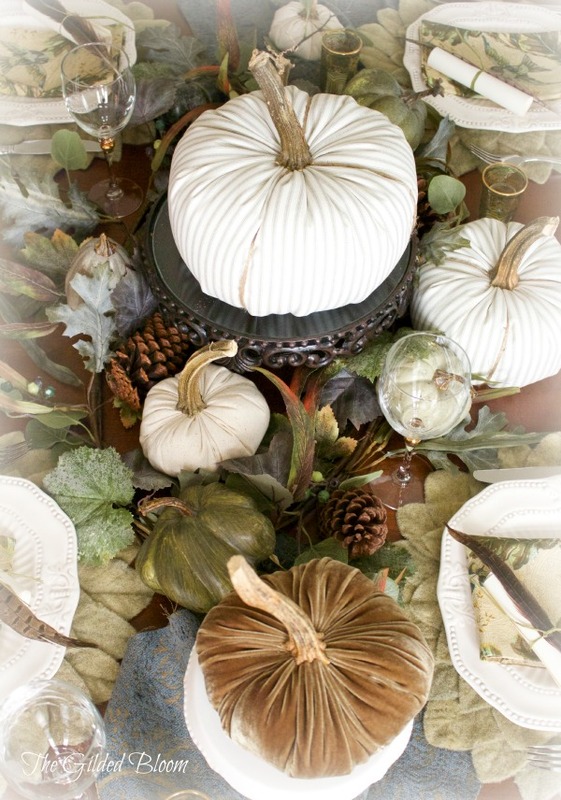 I am so glad you love your pumpkins, and have had fun styling a special tablescape for your guests using them! What a joy that you shared it in blogland! I adore the greenery you used and the feather touches!! Just perfect! Thanks so much, Becky! I love the pumpkins and will treasure them for years to come. You are so talented! Your table is beautiful! 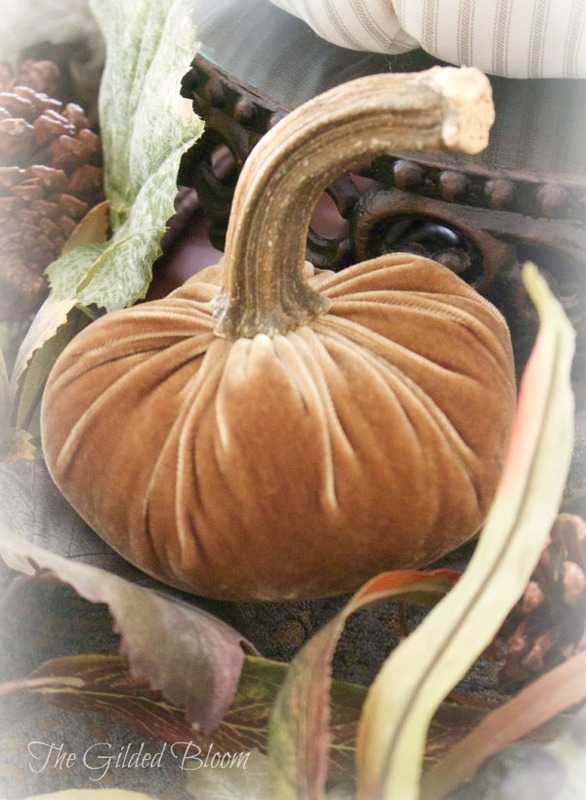 I love how faux pumpkins with the real stems, how lucky to win a giveaway! Thank you Angelina. I had been wanting some of these pumpkins for a while now and was so thrilled to win them at the giveaway!